That's the sender for the dashboard temperature gauge. You have the wrong parts drawing. 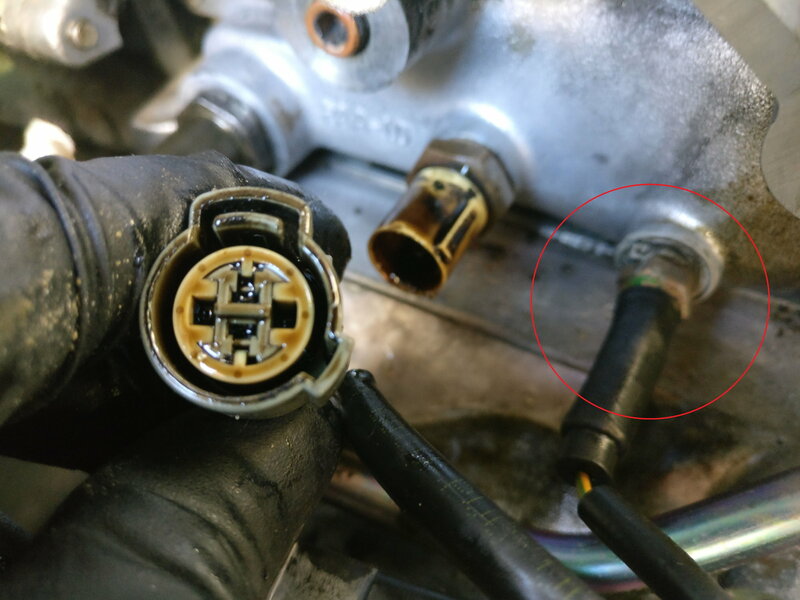 #14 on the picture is the VTEC oil-pressure switch & #15 is a bolt for those models that don't have the switch. Instead of that, look at the picture titled "Water Pump - Sensor" and it's #14. PS the one that's full of oil in your photo is the engine-coolant temperature sensor (signal goes to the PCM as opposed to the dashboard gauge). Good to know, thanks. Distributor o-ring failure. Both of those sensors are getting replaced. You have any idea where I might be able to find a pigtail for the dashboard sender, besides the junk yard? Leaking oil made the old one brittle to the point of cracking. Last edited by shipo; 10-22-2018 at 07:13 PM. ps- haynes claims that this sender was annuled in 2001. Starting 2001 the PCM sends its temperature signal to the gauge, but prior years the PCM doesn't "share" that signal. So you still need that in a 1999 Accord. probably only in american cars. i got 2 heads from 2002 that still have both senders, japanese made. Oh yeah. Sorry, I keep forgetting you're not in USA. Lots of things are different by country.